AMY Jayne Everett has become the face of an anti-bullying campaign started by her heartbroken family after she took her own life. 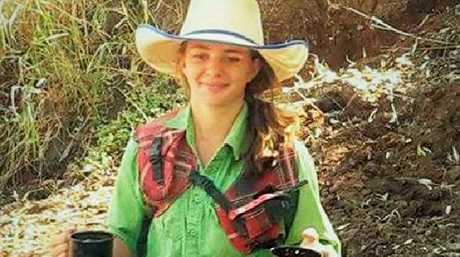 Affectionately known as Dolly, the 14-year-old Northern Territory girl was recognised as part of the Akubra hats Christmas ad campaign eight years ago. 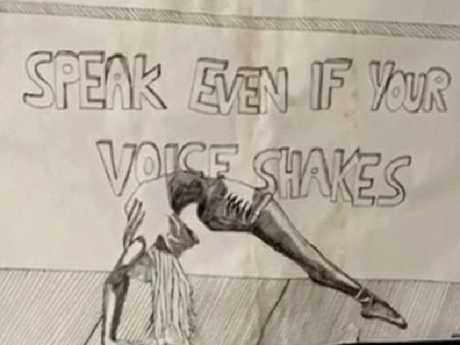 Now, her family has released an image of a drawing she made before her death on January 3, with the words "stand up, speak even if your voice shakes". "This powerful message tells the dark, scary place our beautiful angel had travelled to," her family said in a statement. The image's release comes after the family released a joint online statement which called for an end to bullying. Her father Tick Everett posted the message on his personal Facebook page, saying: "If we can help other precious lives from being lost and the suffering of so many, then Doll's life will not be wasted. "I know for some suicide is considered cowardly but I guarantee those people wouldn't have half the strength that my precious little angel had, Doll had the strength to do what she thought she had to do to escape the evil in this world. "However unfortunately Dolly will never know the great pain and emptiness left behind. "Let's stop the bullies no matter where, but especially in our kids, as the old saying goes. You will never know what have until it's gone." The message finished with a series of hashtags, with one referencing Dolly's poignant drawing. "#STOPBULLYINGNOW #ANGELGIRL #DOLLY #SPEAKNOWEVENIFYOURVOICESHAKES," the family wrote. Dolly was once the face of the iconic Australian hat brand Akubra. The brand has left a tribute to Dolly on its social media accounts, supporting the #StopBullyingNow campaign. "This is not an easy post to write. We were shocked and distressed to hear of the passing of 'Dolly' - the young girl many of you will recognise as the face of our past Christmas adverts," the brand said. "Dolly could be anyone's daughter, sister, friend. We need to make sure that anyone in crisis knows there is always someone to talk to. Be a friend, check up on your mates." Dolly's funeral will be held this Friday at Casurina St Primary School in Katherine East, North Territory. Supporters are encouraged to wear blue, Dolly's favourite colour, and donate funds to the Dolly's Dream charity, in lieu of flowers.